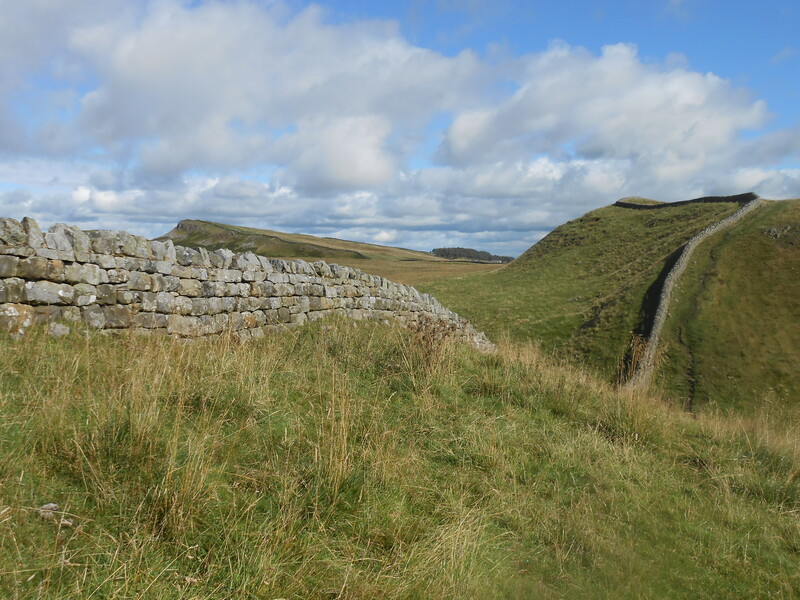 It’s going to take more than one blog to cover all of the experience, so let me start with the primary motivation for taking the trip, which was to walk Hadrian’s Wall. The wall, built starting in 122 AD, extends 84 miles from the North Sea on the east side to the Solway Forth on the west. 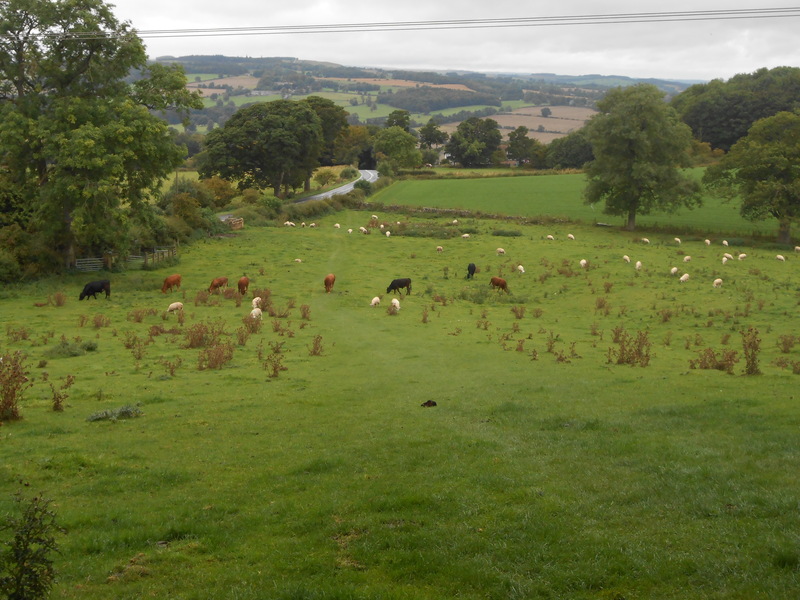 We chose to walk the most popular and most beautiful middle section of roughly 31 miles from Corbridge to Gilsland. 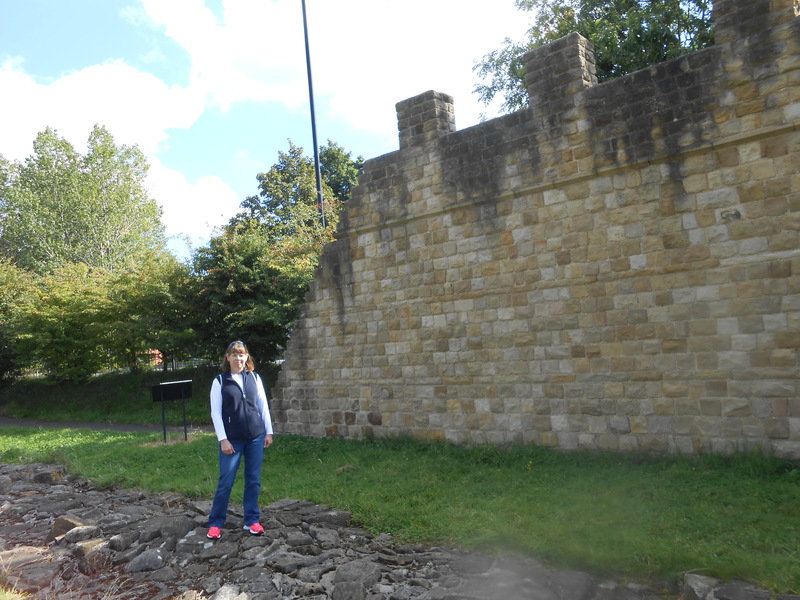 We did, however, start the overall trip in Newcastle and took the train out of the city to Wallsend to visit Segedunum (“Strong Fort” in Latin), which is the far eastern fort and start of the wall–or end of the wall depending on which way you’re going. 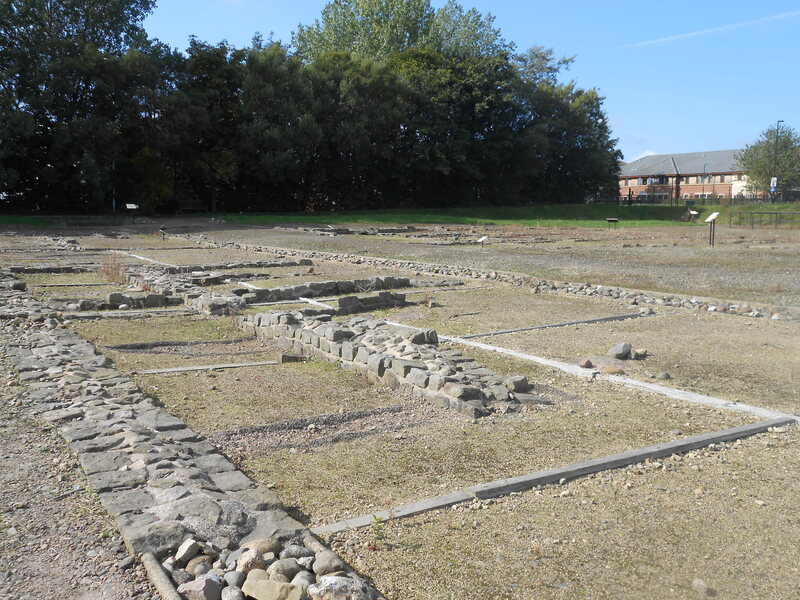 There’s not much left at Segedunum, and the ruins, though extensive in area–it was a big fort–barely break the surface of the ground. The photo below of the site is taken looking almost in the direction of where the wall headed out from the fort. Behind the right end of the trees and just up from the apartment building, you can visit a nice low section of wall (I’m standing on it in the next photo) as well as a 14-foot-high reconstruction of what the wall would have looked like. After a nice stay in a B&B in Corbridge, where the Roman Fort ruins are much more extensive, we headed out on our first day of walking, in the rain. No problem–our Frogg Toggs rain gear did the job very well, and despite five hours of steady rain even our feet in our Merrell boots were basically dry (not to plug these products, but I mention the brand names because they did work so well). Aside from the challenge of the rain, we also had to navigate without a map from Corbridge north a mile and a half to where the wall actually is. Rough directions toward a bridle path and assurance from a passing friendly native got us through the first farmer’s fields with our only having to climb over one fence that we probably shouldn’t have. Then we were there! There was no actual stone wall in sight at that location, but bumps in the ground showed where a Roman quarry was, and the two ditches that accompany the wall, one a defensive ditch on the north and another ditch on the south whose purpose is not well understood by archaeologists, were there. The wall walking path was fairly well marked throughout with white acorn marks at the turns and on the many stiles that we had to cross. We were expecting to be walking on nice rolling English countryside as seen in the next photo. The guide books we had and Wikipedia said things like “the walking is relatively easy, as the highest point on the path is only 1,130 feet high and for much of its length the path is more or less flat.” In the photo you can make out the trampled grass path. That a sheep patty and a cow stand right on that path should have been a sign that all was not as it appeared! There were plenty of patties to try to avoid and more than one huge bull that we had to warily and slowly walk around. Furthermore, the path may have reached only a thousand feet high, but it was not “more or less flat” and after a nice flat albeit rainy start to the walking, over the course of the following two and a half days the nuisance of the rain gave way to beautiful weather but hill after hill such that it seemed we were walking a thousand feet up and then a thousand feet down every time we came to one! Regardless of expectations versus reality, we did finish the 31+ miles, and had lots of fun doing it. 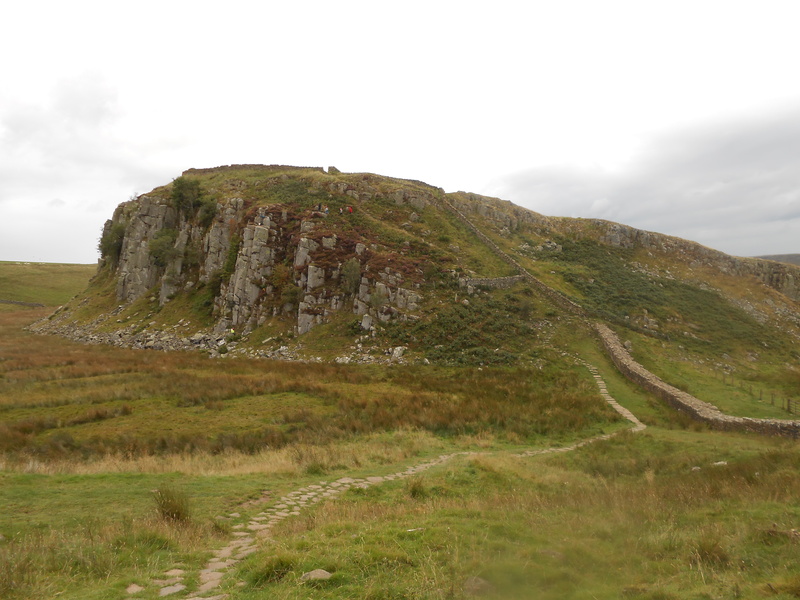 This middle section has many, many ruins of milecastles, towers, and forts, and nearly continuous visible ruins of the wall, and the scenery and sense of history were spectacular. In addition, we met fellow hikers Lorelei and Graham from Australia at the end of our first day and enjoyed greeting them as they passed us a number of times during each of the following days. We also met a fellow from Maryland named David, and at the end of the last day we five had dinner together at the Samson Inn in Gilsland at which we happily and enthusiastically rehashed the literal ups and downs of the journey. We toasted our accomplishment with local ales and a large, very yummy dish of ice cream. More photos of our walk are posted on Facebook at my community site Out of Work Editor. Next Article Next Article: Visit Scotland—Done!